Smoothies have become a part of our morning routines. We try to jam pack as many fruits and veggies into the smoothie as possible, including one of our new favourites, kale. But for some reason we can’t seem to keep kale in the fridge without it going bad. 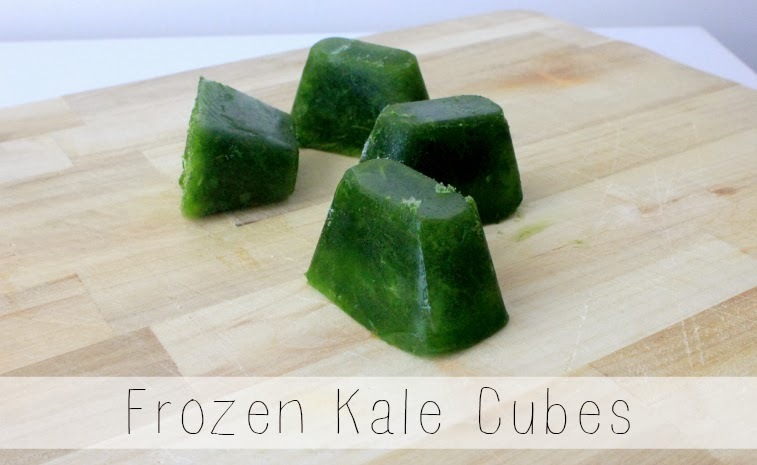 In order to prolong the life of the kale, we decided to make kale cubes. This recipe really is so easy. Why add kale to your smoothie? Kale is pretty much a nutritional powerhouse. It has so many benefits that there is no argument as to why you shouldn't eat it. To prove my point, kale is: low in calories, high in fibre, folate, magnesium, iron, calcium and vitamins A, C and K, has zero fat, filled with powerful antioxidants and great for cardiovascular support, just to name a few. 1. Was and de-rib kale. 2. Add kale and enough water to a blender; blend to a smooth and pourable consistency. 3. Pour into ice cube trays or muffin tin and freeze. 4. Once frozen, transfer to an air-tight container and keep frozen. 5. Use within 2 months. This is such a great idea! I love this! I've done this with spinach and other veggies but will have to try it with kale! !